Chief Sound Engineer Aleko began singing at the age of three. For 7 years, he had been the member of children’s vocal-instrumental band “Chiora”. Being the member of this band, he performed at the opening of the Moscow International Film Festival in 1991. Aleko graduated from the vocal faculty of Tbilisi State Conservatoire. He has 10-year experience of recording, mixing and arranging music. He took part in the TV music project “Star Academy”, worked on numerous interesting projects with well-known Georgian artists, such as Nani Bregvadze, Green Mama, Stephane & 3G. He is experienced session musician, distinguished vocalist and bass guitar virtuoso; however, his real passion is Blues and likes to make covers of famous Blues anthems. Aleko also loves dogs and is keen on Cynology. 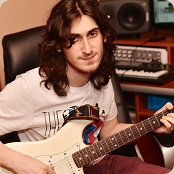 Sound EngineerSince the age of 15, Zviad sings and plays on the guitar. After entering the university, he based the group “Sunny Universe”, and also, the first Music Club of the university. He and his band participated in various student events and festivals. He also performed in other bands of different genres: The Animals from Mars (Electro, Brakebeat); Zomg (Ambient/Dubstep/Triphop). Zviad currently performs in two groups: The Mins (Alternative/New Progressive Rock) and Shraves (trip-step/new rave/electronic). He will perform with vocals, guitar and electronic controllers before the audience. He experiments periodically and gets some new sounds. During a year he used to take musical classes privately. He has worked on the projects like: „Mao Band”, “The Shin” – “EXTRAORDINARY EXHIBITION”, “ELDRINE” – “TILL THE END”. He likes: Muse, Massive Attack, Pink Floyd, Crystal Castle, and Radiohead. Is interested in: music, astronomy, physics, and marketing. 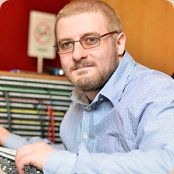 Mastering Engineer Zurab is a graduate of the choir-conductor faculty of Tbilisi State Conservatoire, under guidance of Vakhtang Paliashvili. 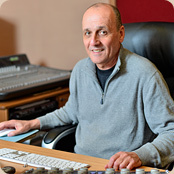 He has 35-year experience of mastering, recording, mixing and arranging music. In 1971-1990, Zurab was a member of the band “Iveria”. While touring together with "Iveria" around the world, he performed, as a songwriter-performer, for audiences of 70 countries. He was awarded with the title of the Republic’s Artist of Merit. He is the author of many children’s songs; his music was used for numerous commercials and TV projects. Along with classical performers, such as Stevie Wonder and Ray Charles, his favorite musicians also include Bjork and Sting. Zurab is the big fan of motorsports and especially loves Rally. Arranger Probably the best music arranger in Georgia. He is the author of many songs, including the hits, such as Ia Chantladze’s “I Don’t Love You” and Aleko Berdzenishvili's Eurovision contest song “Amazingly Beautiful Girl”. He has 15-year experience of studio work. In 2004, Peke released an album of his own songs, named “Calligraphy”. In the same year, one of the songs from this album – "I’m Looking for That Month”, reached the semi-final of one of the most prestigious open competitions of US songwriters – International Songwriting Competition. Peke is the author of arrangements of many well-known songs; he composed music for the films “37” and “1005 Days of Independence”, as well as for numerous commercials. 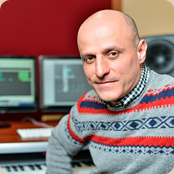 He also worked on the music for a number of programs on the TV of Adjara. Being asked about his hobby, Peke names Travelling without hesitation. His favorite musicians include Miles Davis, Marcus Miller and George Duke.